Back row, left to right: Don Ehrett, Bill Nelson, Dave Skillman, Coach Lewis, Don Hannan, Herbie Raab, Jim Ennis. Front row: Jim Lee, Trainer, Jay Nelson, Howard Harris, Chuck Busby, Pete Vetter, Herb Gerecke, Bobby Watson, Bert Van Horn. 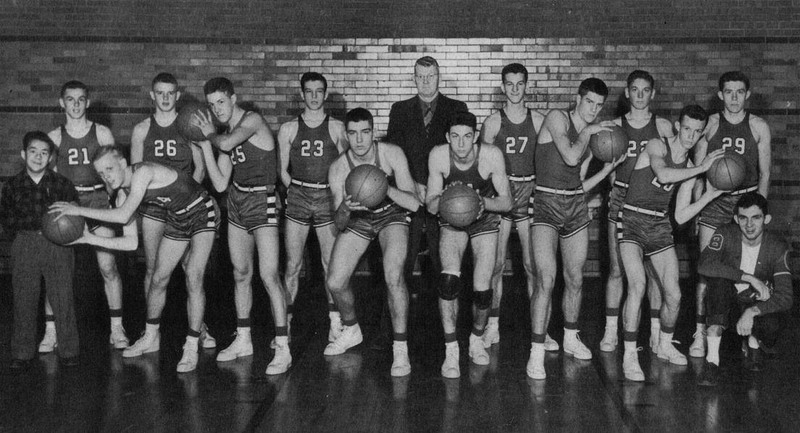 The 1947 and 1948 Pekin Basketball Teams had many similarities at the time. 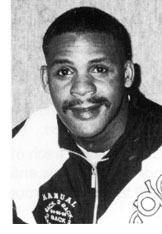 Both teams were led by head coach Jim Lewis and assistant coach John Moss. Both teams won more games combined (59) in a two year period than any other Pekin teams at that time. Six players; Don Ehrett, Herb Gerecke, Howie Harris, Bert Van Horn, Chuck Busby, and Jay Nelson played on both squads that placed 4th in state in 1947 and 3rd in state in 1948. Both teams were their respective season’s Greater Peoria Conference Champs and were ranked in the top ten in the regular season basketball poll; #10 in 1947 and #1 in 1948. In 1948, Herb Gerecke was named to the Chicago Daily News all-state team and 6-2 senior, Chuck Busby (top vote getter), Bob Watson, Jay Nelson, and Herb Gerecke were voted to the all-state tournament squad.